Most of the business articles that come across my screen have more to do with crowdsourced innovation and corporate governance than basic organizational effectiveness, so is this post 60 years too late? If you’re tempted to dismiss my insistence on fundamentals as naive in search of more lofty pursuits like a handwringing debate on whether culture or strategy is more important, feel free – but don’t do so without taking stock of how consistently you live by these rules. Too busy? Other people will take care of it for you? Get paid too much to take notes? Whatever your justification, try sticking to the basics I’ve listed below for three days in a row and see what you notice in your team’s productivity and morale. Invite only the essential personnel to the meeting, and look at their availability before selecting a time. Corollary: reschedule the meeting if essential personnel can’t attend. Start your meeting on time, with a copy of the agenda (see #1) visible to the group. Ask for additions/edits to the agenda and then proceed. 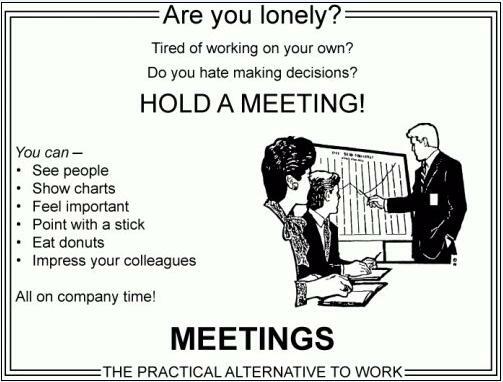 Corollary: don’t show up late to meetings. Communication in meetings should be in the form of either requests or promises. Everything else is self-serving and wasteful of the group’s time. Corollary: find other means (like an internal blog, email distribution list, corkboard at the coffee machine, or daily voicemail to your team) of sharing information so that it doesn’t need to be done during a meeting. End your meetings early so that attendees can arrive on time to their next commitment (or just get back to doing their real jobs). Corollary: if you are speaking near the end of a meeting’s agreed time slot, check with the organizer to see if he or she wants to cover any additional topics before you continue speaking (see #4). Send a follow-up email to everyone you invited to your meeting–including anyone who did not attend–thanking them for the time and recapping agreed actions (see #4). Corollary: Recurring meetings should have a known repository for agendas (see #1) and minutes to reduce easily ignored email traffic.